So, the rules of this contest are to pass the torch to FIFTEEN other blogs, and tell you seven things about me. I can chose to accept or decline. You know me... I will bend the rules a bit. That's too much work right now. lol I will nominate 6 SUPER-versatile bloggers, and tell you 3 things about me that you might not know. How about that? 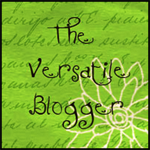 I follow a LOT of blogs, but most are not 'versatile' if I understand the term correctly. Most are experts at what they do, and they do a lot of that one thing they are really good at with little deviation. #1. Cheryl of Grandma Coco's Designs. She quilts, does incredible applique, postcards that blow my mind, illustrations that throw me off my chair, and she knits, makes & sells patterns, she even makes jewelery. Versatile? Absolutely. Cheryl - you rock. Oh - and you make the prettiest cookies I have ever seen. #2. Christie of Describe Happy. She was the first blogger I found that is truly versatile in a sea of cookie cutter quilt blogs (or at least that's how I felt at the time with all the quilt alongs - everyone was doing the same thing!) Not Christie. She makes her own off-the-beaten path quilts, and fearlessly I think. She comes across as - well - Happy! So, who cares what other people think? She posts a lot about her beautiful pooches, her woodpile and how it's stacking up, and now she's stirring the post by making 'confetti' art quilts based on her photos. She great at it (photos and art quilts)! Oh - she also was running, and that's why I wrote to her to see if she would like to reward each other with mail goodies if we promised to run regularly for a period of time. #3. Becky of Becky's Blabber. Becky makes weird quilts now and then. By weird, I mean strange - but good! She's good at it. Hmmm I'm not doing this justice am I? let me explain. When I found Becky's blog, she was making chemistry blocks I think. Or blood cells? I think there was sperm & eggs too that she appliqued! It was truly out-of-the-box. It ended up being a cool modern quilt. It went into a show and she was interviewed in by her local newspaper. That was COOL! She also got addicted to postcards and we swap at Postcard Cottage. She dove right in and she is GOOD! She's so creative - and versatile. She'll be the one to email me to tell me that it was all done in glow-in-the-dark thread. : ) She has kindle covers in her etsy store... and probably a lot more since I last looked. Michelle takes BEAUTIFUL photos. Michelle knits and hooks and crochets and felts and designs blocks and quilts and takes more beautiful photos of all of that. Her blog is very relaxing. The lighting is always good. She has a mood, and being there is like a little vacation to a new place plus a trip to the antique store. : ) Very versatile indeed. She's the owner of our local quiltshop, and if you want to see a LOT of quilts photos, she filled her gallery link at the top of her blog. Go look! Elle's blog is intriguing to me first of all because her banner is her chicken coop. : ) She quilts, she doodles, she beads, she rearranges and repaints and refinishes her home, she is an awesome grandmother to some lucky little monkeys, and she experiments a lot. She is very versatile, and she is good at showing so much process and photographs everything she tries out. #1. I was pregnant with a boy who was BIGGER than a 10lb sack of potatoes. When we go to the grocery store, I make him try to lift an 11 pound watermelon so he can be amazed at how big he was when he was born. He LOVES that story. Okay, passing the torch now to Jane, Elle, Michelle, Becky, Christie, and Cheryl. Thanks again Margaret! I'm going to check out each and every one of the blogs you listed. Rock on, Monika! It was fun to read about the bloggers and nice to read the little snippets about your life! wow, you have me in some great company! I'm can't be that versatile because I'm stuck for words. LOL Thanks. Thanks, Monika. I feel honoured. Here I thought I was just unfocused.